Capt. Bill Couette, ALPA vice president–administration/secretary, leads a session at this week's conference. 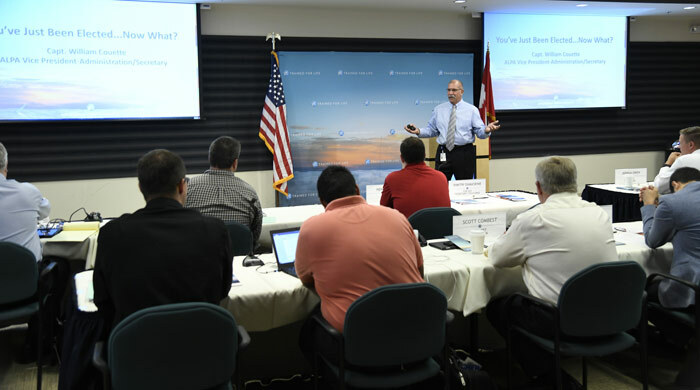 This week, 18 new ALPA leaders, representing 12 pilot groups, attended a Leadership Training Conference at ALPA's Herndon, Va., offices on August 28 and 29. Capt. Sean Creed (Spirit), member of ALPA's Leadership Committee, welcomed the recently elected reps to the two-day conference, which focused on providing a firm understanding of how the Association works and setting these reps up to succeed in their new roles as local council rep, a member of your MEC, and a member of ALPA's Board of Directors. As the main point of contact for their members, these reps are the first call a pilot will make when having issues with scheduling, hotels, pay, or irregular operations. The challenges ALPA reps face require crafting a careful strategy, executing a meticulous approach, and utilizing the tools and techniques ALPA provides. This training provided these new reps with the resources to better serve their members, which advances one of the Association's strategic goals. All four of ALPA's national officers presented at the conference, along with subject-matter experts from many ALPA departments. Attendees learned all about collective bargaining techniques, how to meet with the chief pilot, communications strategies, the status of our Association's finances, our governing bodies structure, and much more. In the end, ALPA's newest reps learned the full scope of their responsibilities and left with the ALPA tools and resources to be successful advocates for the members they represent.